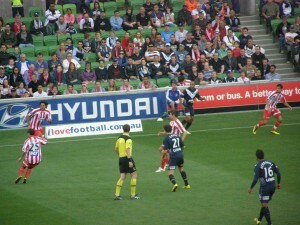 Melbourne Victory had too much firepower for Melbourne Heart and won the second local derby by three goals to one at AAMI Park in front of 23,059 fans. 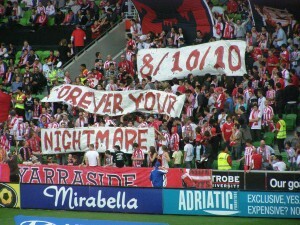 This was another home game for the Heart. Josip Skoko was not risked and Michael Beauchamp started on the bench for the home team, with John Aloisi leading the attack. Victory dropped Rodrigo Vargas for the first time since he established himself in central defence, though this had as much to do with the tactical arrangement giving Matthew Kemp and Surat Sukha the wing back roles, as any dip in form. Both sides had attacking line-ups, so an open game was to be expected despite their recent lack of success. 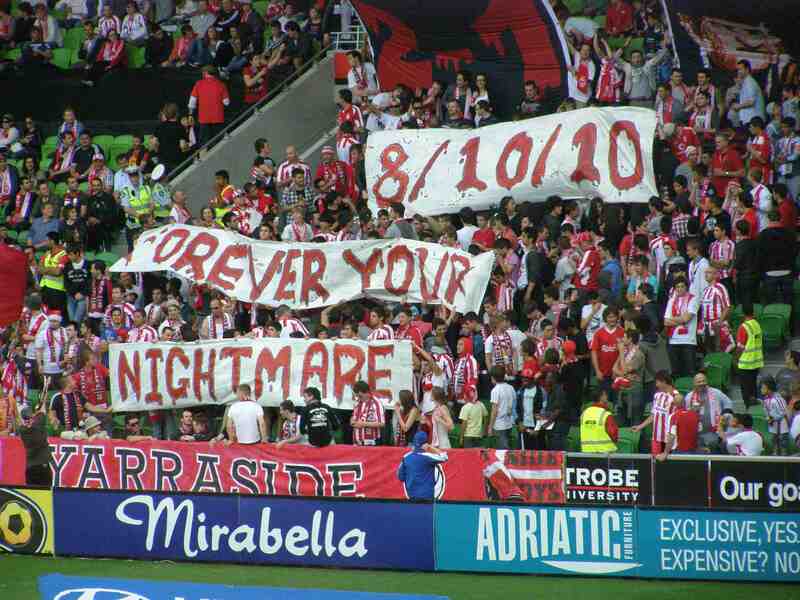 Both sets of fans excelled themselves with their banners and chants, though the Victory outnumbered Heart by some margin. The first half had three goals, lots of near things and a couple of howlers. Victory got the break after Surat Sukha robbed Rutger Worm in the Victory half and quickly transferred the ball to Carlos Hernandez. The Costa Rican held it up and then put Archie Thompson clear on the right. The striker hit the bye line and squared the ball across goal and his partner Robbie Kruse nipped in between keeper Clint Bolton and Simon Colosimo to apply the short-range finish. That was in the 12th minute. 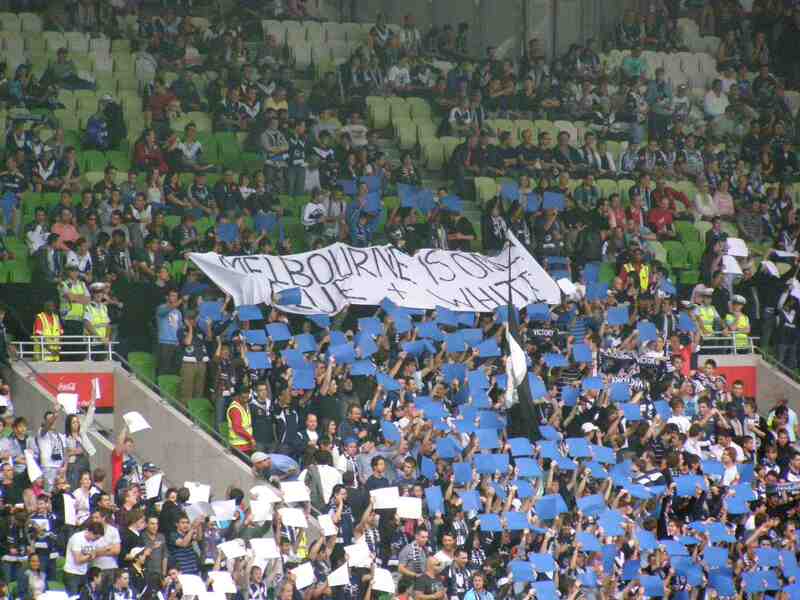 Five minutes later Kevin Muscat impeded Adrian Zahra but though it appeared to be obstruction, referee Chris Beath allowed a direct free kick, which Gerald Sibon deliciously curled around the wall to the astonishment of Michael Petkovic. In the 28th minute Matt Thompson raffled a dropping ball and was robbed by Robbie Kruse, who had the momentum to skip clear of the chasing defence and beat Bolton, who for the second match in succession found himself in no man’s land. 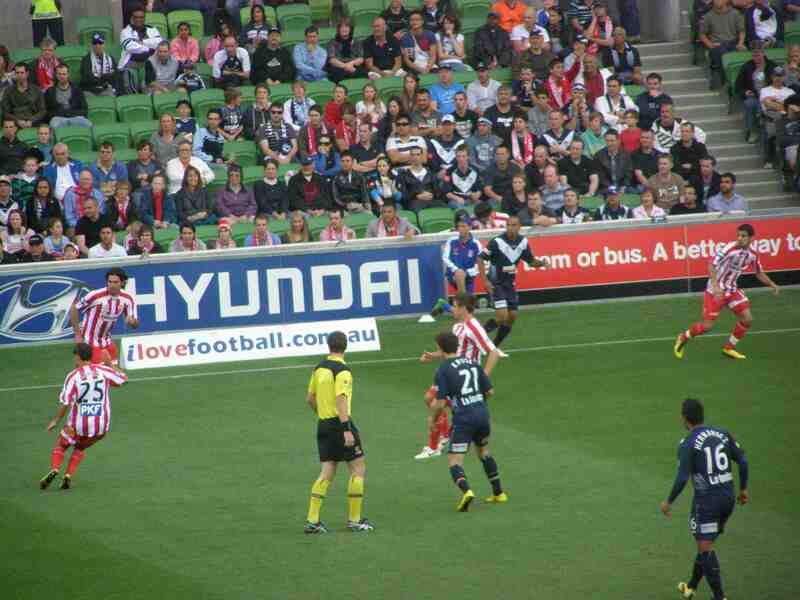 Hernandez had a dipping shot touched over by the keeper and Adrian Leijer just managed to block John Aloisi in injury time at the expense of a fruitless corner kick. Both teams made changes at the break, with Kristian Sarkies replacing Gerald Sibon who had a hamstring strain and Tom Pondeljak taking Billy Celeski’s place in the Victory midfield. 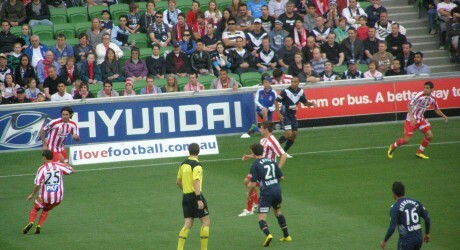 The second half was killed by the Victory’s third goal in 54 minutes. 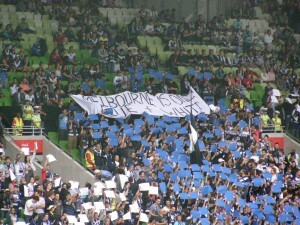 Archie Thompson fired over a cross and Adrian Leijer threw his body at the ball ahead of Wayne Shroj and forced it over the line. Heart did have some close efforts, including a couple of dipping shots by Nick Kalmar and Sarkies which kissed the top of the cross-bar. But Victory was always firmly in control, dropping deeper and forcing Heart into a slower build-up which gave the visitor time to snuff out most attacks. Heart coach John van’t Schip put a brave face on the performance, but realises that the striking stocks are very thin, and with Sibon likely to miss several games, even more meager after this game. Ernie Merrick was delighted with the Victory performance, mentioning the contribution of Surat Sukha and Matt Kemp, whom he instructed not to go bombing down the wing until he is fully match fit. The wing-back only got off the leash once, but that side of his game will be a great asset in the run-in to the finals. The result means that the third match between these two teams at Etihad Stadium on 22 January will be for local bragging rights.